The California Government projects that 15% of State employees (30,000 people) will retire this year alone. The state needs to replace these talented individuals. But like many government entities, the State struggles to attract and hire high quality employees. Why? California is a great employer. The work is interesting and fulfilling, and California benefits are among the best. But one challenge is that getting a job with the State is a complex effort that can take up to 9 months. Yet the real problems begin even before this complex hiring process can start. There was no one-stop online resource for finding a state government job. 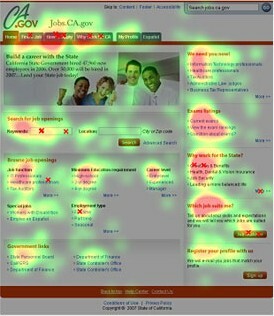 The distribution of the red eye tracking "hotspots" shows that job seekers only focus on a few places on the old site (left). In contrast, the visual design of the new site causes them to scan the page. Problem #2: Citizens don't know who the State Personnel Board (SPB) is. Nor do they care to learn. There are actually several agencies that have job listings for State Jobs. Though the SPB has the most comprehensive State job list, citizens don't know this. They just want one place to look and apply for a job. If the process is too hard, they will look somewhere else. Problem # 3 is the visual design of the old site. The use of color and typography fails to guide peoples' eyes through the content. To address these issues the State Personnel Board engaged HFI to do research on how citizens look for jobs. HFI's user experience experts observed people as they tried to find and apply for jobs online. HFI listened to how they thought it would work and applied advanced research methods like eye tracking to capture what people were really doing. 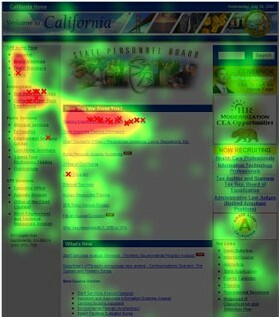 The eye tracking analysis confirmed the issues surrounding the visual design of the site. Most people looked to only one place on the page, and it was the wrong place to look. Because of the nature of the visual design, nobody looked anywhere else. Ultimately, even the people who found the site couldn't really use it effectively. HFI saw there was a mismatch between what people expected and how the process actually happens, then designed to close this gap. HFI synthesized field research findings with best practices from the private sector to design and recommend a one-stop jobs service center for California: Jobs.ca.gov. This redesigned site intuitively supports the expectations of job seekers and fulfills the needs of the state government as a one-stop eService center. Color and layout encourage people to scan the page. Site visitors find what they are looking for. They are also drawn to notice other things the site has to offer. 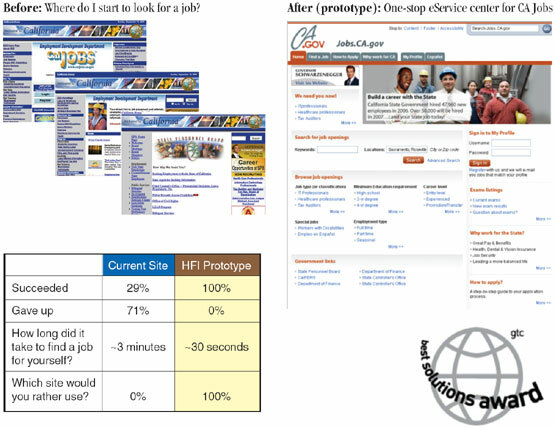 HFI's user-centered design methods resulted in a site that is easier, more efficient and more enjoyable to use. Once implemented, it will help California find employees and Californians find jobs. HFI's redesign of the California State Personnel Board Website was recognized with a "Best Solutions Award" at the September, 2007 Government Technology Conference in Albany, NY.